Cabinets Mod-eez RTA "Ready To Assemble" product line includes all of the following. The video is viewed best in Internet Explorer, other browsers may distort frames. 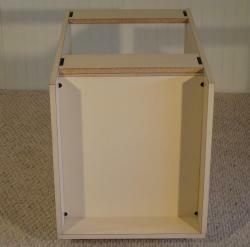 The Cabinet above is assembled using the Mod-eez® Fastening System. The top shelf has been mortised with access windows and uses Mod-eez® #5033 Non-Locking Double Clips. The middle shelf has been mortised with long “Dado” like pockets and uses Mod-eez®#5039 Non-Locking Pass-Thru Double Clips. 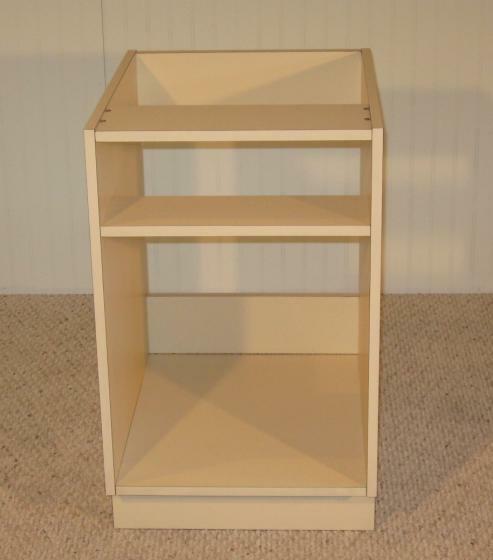 The bottom shelf has been mortised with access windows and uses Mod-eez® #5032 Non-Locking Clips. The back rails have offset mortised pockets and use Mod-eez® #5033 Non-Locking Double Clips. The toe kick has been drilled with 8mm holes and uses Mod-eez® #5053A Compression Dowels. Click on the above link “Cabinet Assembly Video” to view the movie that demonstrates the use of the Mod-eez® Fastening System for this particular application.